Exactly 22 years after he won his first major championship, and his first Green Jacket, and 3,955 days after he won his last major Championship – the 2008 US Open at Torrey Pines – 43-year-old, Tiger Woods, has won the US Masters for a fifth time, a record-breaking 14 years after his fourth title. It’s his 15th major in total and some of the numbers are just mind-blowing. Just two years ago, having plummeted to a world ranking of 1,199, Woods underwent a fourth operation on his troubled back. He wakes up today as the world number six. He couldn’t get out of bed. 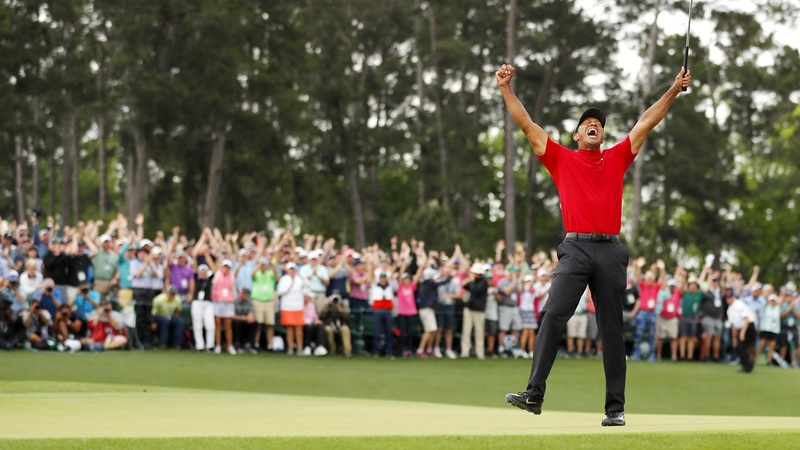 It’s very hard to think of a better sporting comeback and there probably isn’t one – it’s a truly remarkable story and a fabulous shot in the arm for the game of golf. Mike Norman has looked at Tiger’s chances of building on his success here. As detailed in the In-Play Blog, Tiger began the final round two shots behind last year’s Open Champ, Francesco Molinari, and trading at [4.9], having begun the week as a [21.0] /[22.0] chance. Molinari continued to play solid, faultless, golf and after Woods has bogeyed both the fourth and fifth, the Italian, who had been a [30.0] chance before the off, hit a low of [1.6]. Molinari dropped a shot at the seventh (just his second bogey of the week) but he bounced back with a birdie at eight and he looked in control until this happened at the 12th. Could this shot cost Molinari the Masters? His tee shot at the 12th bounces on the bank quickly rolls back into the water. Year after year the par three 12th is at the nub of the story and with other leading contenders, Ian Poulter, Tony Finau and my pre-event pick, Brooks Koepka, all finding Rae’s Creek as well as Molinari, it was again on Sunday. Woods winning was a wonderful story but from a personal perspective, seeing Koepka beaten by a single stroke was extremely frustrating. Unfortunately, he never traded any lower than the [4.4] he hit on Friday morning so other than laying a bit back before round four to recycle on Molinari, I didn’t manage to lay anything back. It was a really strange renewal from a trading perspective and it only really all made sense at the end. I was frustrated with myself for not backing Molinari sooner than I did and had I backed him after round one at [30.0], or after round two at [9.0], I would have finished the week in front because I would have layed him at odds-on but I’m not complaining. From the very start, this year’s renewal was the most competitive edition I can remember. The leaderboard was congested with quality throughout. As a demonstration of how clogged with quality the leaderboard was this week, we saw five players tied for the lead at halfway for the first time here and with just a few holes to go yesterday, 11 players were within two of the lead and Patrick Cantlay, the world number 22, was the lowest ranked among them! Put the Tiger win aside for a second and it was still a remarkable edition. It was a fantastic story and one I’ll long remember but Tiger never appeared anything like a value play to me so I’ve absolutely no complaints. I remained cautious throughout the week and as a result, losses were minimal and for that I can only reflect and feel happy about the way I played it. When all is said and done, Tiger winning was a truly remarkable feat and truly remarkable feats are usually a bit bigger than 20/1 shots. Length off the tee proved hugely beneficial this week. Woods only ranked 44th for Driving Distance but he could get it out there on the holes that he needed to and the three men tied for second ranked 4th, 11th and 13th. Tony Finau, who finished tied for fifth, ranked first for DD but experience of Augusta was the difference in the end. Not to aim in between the bunkers on 12 and to accept a two-putt par was a huge mistake by both Molinari and Koepka and it arguably cost them both the title but you also need a bit of luck. Or was it luck? One or two suggested that Tiger deliberately missed the 11th fairway by miles to get a look in at the green. I’m not convinced myself but he certainly had a nice view! If that wasn’t luck, then poor old Molinari’s was at 15 and it was all bad luck. His drive finished up just wide of the fairway, forcing him to lay up but I don’t think he even contemplated hitting the tree with his third. The double-bogey there after finding the water again was the nail in the coffin. And just to emphasise the importance of course knowledge, Woods sealed the deal with this magnificent tee-shot at 16. Well, that’s enough looking back, we’ve got another great event to look forward to this week – the RBC Heritage – and I’ll be back later today or more likely tomorrow with my preview.